Happy Monday friends! Hope you had a great weekend. Ours was SO fun enjoying what might be the last of the summer weather here in Boston! Friday evening, I met Steven for our weekly dinner and drinks. We ate at a restaurant called State Street Provisions near the Boston Harbor. It was definitely good but not my favorite of the places we've tried! Saturday, we grabbed brunch at Granary Tavern also near the Harbor and then met up with an old boss of mine who was stopping in Boston on a cruise with his wife. It was so nice to see him and really spur of the moment! After that we watched the new Solo movie and it was pretty good. I'm not a big Star Wars girl but I REALLY liked this one! Sunday, we got lunch and walked around the Davis Square area and stumbled upon the Somerville Flea Market. It was pretty neat and just another excuse to enjoy the warm weather! After that we went to a beer garden in Somerville for a few drinks then to our favorite restaurant in Somerville--the River Bar. We just love it because it's pretty much all outdoors and has a gorgeous view of the water--plus they make an amazing Aperol Spritz which never hurts! In preparation for the fall weather, I've been stocking up on a few transitional pieces for my wardrobe. I feel like this year that rust/burnt orange color will be dominating my fall wardrobe! I don't know why but anything I see in that color, I want to purchase. I'm also loving neutrals as always and I'm more into plaid this year than I have been in the past. What colors are striking you for fall?! Yay for a fun weekend! The rust color is my favorite this Fall too! Happy Monday Babe! Oh you got some great pieces!! I LOVE those ankle boots! I'm currently doing No Shop September but they're on my October wishlist. Love that rust sleeveless turtleneck sweater, too! Oh wow - this is all absolutely gorgeous! Loving all your picks - they're perfect for the Autumn months too as the colours are suited for this time of year! Gorgeous items you purchase. I really like all of them, but hat and sweater are my favorite. 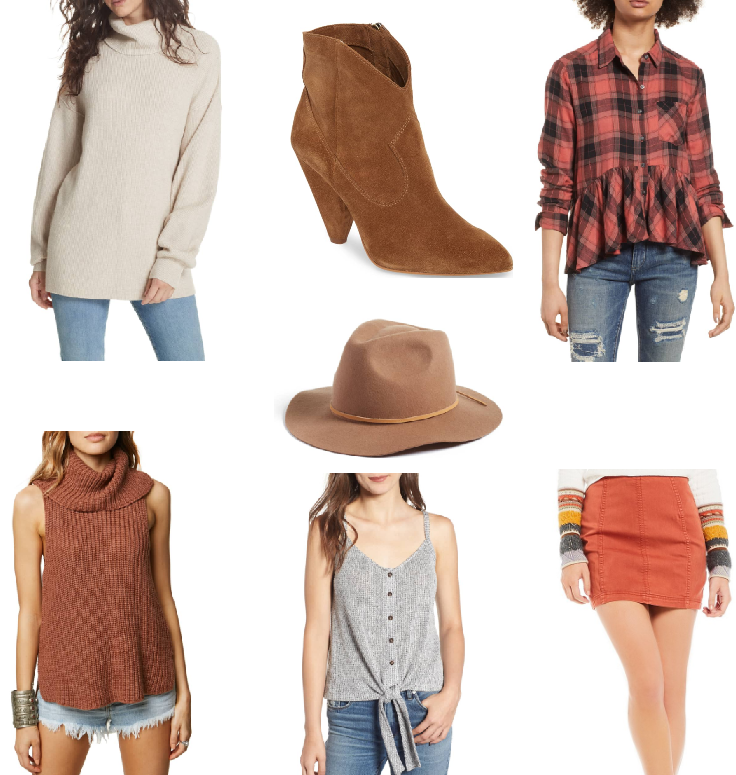 Loving these fun new fall pieces- I've been slowly adding more fall-appropriate stuff to the closet, too! Beautiful picks! I think this season I'm going to wear lots of grey. Love, love, love! That dress is fall perfection.